Shell-shocked anew, the denizens of otherwise picturesque, seaside little Broadchurch are far from returning to any semblance of peace and quiet. Season 2 of the acclaimed drama series returns in full force to BBC America on Wednesday, March 4th at 9 p.m. (central). 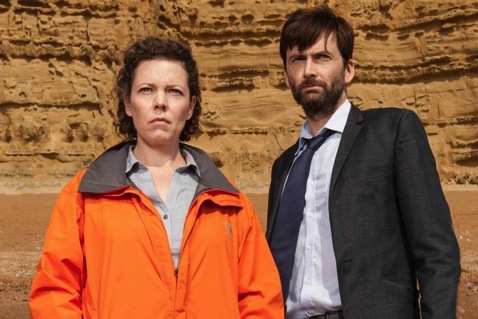 Again at the center of Broadchurch are willful, damaged crime solvers Alec Hardy (David Tennant) and Ellie Miller (Olivia Colman). But the cast also is buoyed by the additions of Charlotte Rampling and Marianne Jean-Baptiste as opposing barristers in the trial of accused murderer Joe Miller (Matthew Gravelle). Season 2 begins with what’s expected to be the cut-and-dried trial of Joe Miller, who is detective sergeant Ellie’s husband. She remains traumatized and ostracized by the parents of the 11-year-old victim, Danny Latimer. But after confessing to the murder at the close of last season, Joe confounds one and all by pleading not guilty at his hearing. This is where Oscar nominee Baptiste (1996’s Secrets & Lies) comes in. She plays tough, hardball-playing Sharon Bishop, whose former mentor is the retired Jocelyn Knight (Rampling). Highly reluctant to get back in the game, Knight finally relents upon learning that Bishop will be her courtroom adversary. Season 2 otherwise is fueled by the re-emergence of a double murder case that Hardy thought he’d left behind after his days as a detective in Sandbrook. His inability to get a conviction of prime suspect Lee Ashworth (a glaring James D’Arcy) left him shattered and even more short-tempered upon arriving in Broadchurch to take the position that Ellie thought was hers. Ashworth, who had left the country after being let go, is now lurking around Broadchurch in search of his still shaken wife Claire (Eve Myles). Hardy has hidden her in a Broadchurch country house after she betrayed her husband and made him the No. 1 target in the deaths of Sandbrook cousins Lisa and Pippa. But Claire is now in renewed jeopardy while Hardy is beside himself. It doesn’t take much for him to go off the rails. Not only in the face of a case that continues to haunt him but when pressed anew by aggressive, ethics-challenged young newspaper reporter Olly Stevens (Jonathan Bailey). “You people. You think you’re saving the world. You just make it harder to live in,” Hardy says through clenched teeth in Episode 4. It’s a line that might well make many a viewer cheer. Other dirty little secrets emerge as Broadchurch weaves more webs of captivating intrigue. The additions of Rampling and Baptiste are masterstrokes, making the series all the more engrossing as they battle in court and tend to their disparate outside interests. Tennant and Colman still command center stage, but not without considerable help from the incoming fellow thespians. Under these circumstances, it’s not a case of the more the merrier. Instead it’s an even richer recipe for a seriously dramatic series that already had an A-game in place.